The Department of Environmental Protection, in consultation with the Department of Conservation Services, is currently investigating an ongoing fish mortality event involving multiple species. 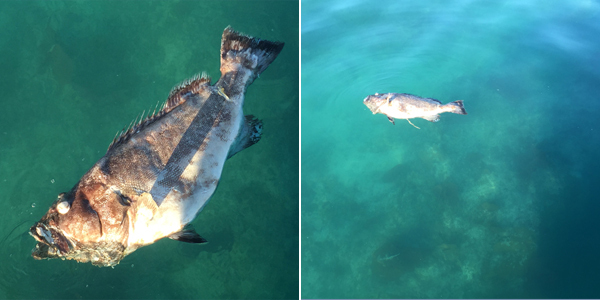 A spokesperson said, “The Department is actively investigating reports of large fish, including Black Grouper, found floating, dead or dying, on the surface of the water. These incidents are being reported around the reef platform and the fish are usually found individually. “Fish kills occur on the reefs in certain years and are often associated with warm sea temperatures and plankton blooms. However, there is currently insufficient data to offer a definitive explanation for the recent die-off events, all possible causes are under active consideration. “In an abundance of caution the public is advised not to eat any fish found floating and to report any observations of dead fish to the Fisheries Department email address: fisheries@gov.bm. Doesn’t this happen almost every year? Is it something to do with hurricanes? We still don’t know? Good news is PLP havnt been getting de blame for a minute, now thats progress. No doubt they will be expressing their grave concern. Thank god for Anne Cartwright… this problem wouldn’t be happening they would have long been dead ! Might be a dangerous lionfishus kimathius ! THAT’S SAD TO HAPPEN. Hope they also check the East coast USA, the Caribbean countries and a world environmental + fisheries body to compare info.